Does free will exist? Or is there a predetermined destiny for each one of us? For thousands of years the man has been faced by this question, without finding satisfactory answers. On the issue, about two centuries ago, Pierre Simon Laplace, a French mathematician and philosopher, took an extreme stand: the universe is a huge clock and all entities, including humans, act as cogs. So there isn’t free will. 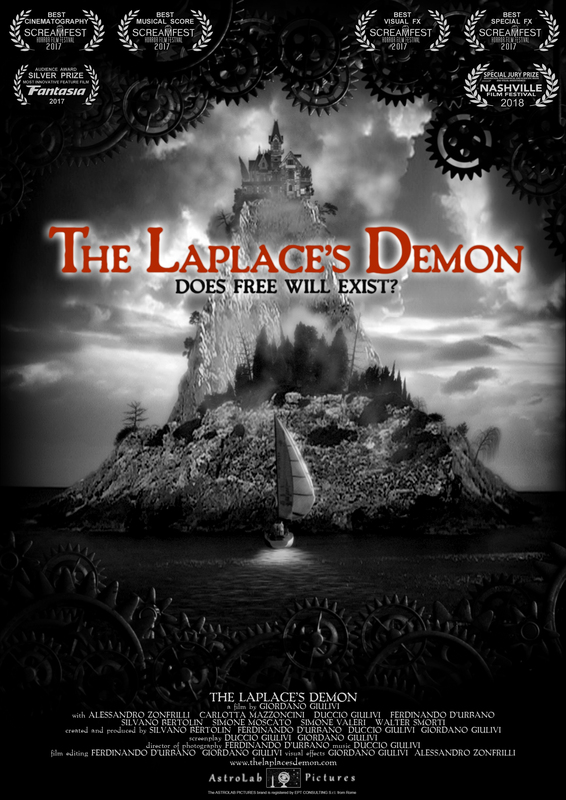 Based on this theory, “The Laplace’s Demon” is born. It’s a thriller about destiny and free will, simulating a reality ruled by deterministic laws in a simple way, thanks to a story rich of paradoxical situations, in which philosophy isn’t the main theme of the movie, but rather an engine that starts the story and overwhelms the characters. We’ve been two goals since the beginning. The first one was to make a thriller, whose protagonist was a strong, coherent and involving plot. Every part of the movie (photography, acting, editing, special effect, etc.) had to serve the story, not the other way around. The second one was to opt for a very different style in comparison with other movies of this type, in particular for an element: violence. In fact violence (visual, physical, verbal) seems to be a fundamental ingredient for contemporary thriller and horror movies, as if public wasn’t expecting anything else. We believe instead that public can be simply involved with a well-conceived suspense. In order to achieve these ambitious objectives, we looked at great masters of the past, such as Alfred Hitchcock and Val Lewton and also at some unique movies as “And Then There Were None” by René Clair and “The Haunting” by Robert Wise. So we followed in the footsteps of that American classic cinema, in which fear didn’t emerge from easy expedients as cruelty of images or a sudden scream or particular special effects, but rather from an exciting plot and especially from sense of tension and suspense, of which it was full. We invested two years for developing an original plot that worked as a clockwork and we took five and a half years so that the script came alive in a movie with a little bit old fashioned look, especially in photography (a black and white with a great contrast) and scenography, for which we used a technique no longer used, that of the rear projected backdrops. For music, totally created with the computer, we carefully selected and used classic instruments, especially avoiding too modern rhythms and sounds. In conclusion, our movie looks really at the past in its style, also using a classic narrative scheme, but developing it in a completely new way.